It is time for a fundamental rethink on how to run a biotech company, starting with the crucial, symbiotic relationship with pharma. A flurry of court decisions in 2011 on Supplementary Protection Certificates issued has profoundly altered the nature of this important protection for intellectual property. France ranks second only to the US in terms of healthcare spending. But cost-cutting measures and safety provisions under recent health reforms are affecting pharmaceutical pricing and reimbursement. The law governing reimbursement of drugs in Germany, AMNOG, came into force in January 2011, bringing in assessment of the added benefits of new products similar to that used by NICE in the UK. A look at recent major deals, including a surprising recent move from Vernalis that may offer a new business model for biotech companies. 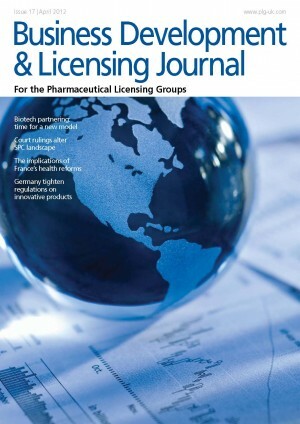 This issue of the Business Development & Licensing Journal makes for rather sober reading, especially amid the current changes to our industry and lingering uncertainty. We always aim to keep our articles topical, with content relevant to the current concerns of business development executives. The partnering environment is fairly tough right now: while in the article from Evotec, we see concerns expressed that early stage deals may not deliver the maximum value, with pressure to partner for cash flow and scientific credibility, it is difficult to ignore an offer on the table. Our European focus in this issue offers valuable analysis of the burning issue – pricing and reimbursement, and how this impacts on our day-to-day deal making. Changes to already complex healthcare systems in France and Germany may further muddy the waters for pharma companies but dwindling state budgets mean governments are more likely than ever to apply the rules rigidly in a bid to keep costs down. In such an environment, a clear understanding of the requirements is vital. Equally, a flurry of court decisions on Supplementary Protection Certificates (SPCs) is altering the nature of this important IP protection. The emerging picture will lead to new opportunities for some companies (both innovators and generics) and challenges for others. Despite economic difficulties all around, deals are still happening, although possibly not at the prime values anticipated by the original investors. While the current period will be demanding, those who survive will be all the better prepared to thrive over the longer term. From crisis can come opportunity.